I'm back with another New York City itinerary and this time it's all about family trips to the city. Even though I don't have kids and wouldn't necessarily describe myself as being super knowledgable about the subject, many people comment that I have good instincts when it comes to suggestions for kids. New York may not seem like the most kid-friendly place, but there really are so many cool things to do. I'm making a point with these recommendations to suggest things that would be fun for all ages. Family trips often involve every age from toddlers and older kids to teenagers, young adults, grown adults, and grandparents so it's important to keep things kid-friendly without being too "kiddie" and boring for the other family members. This luxury hotel is next door to MoMA on the classic 5th Avenue. It's only a few blocks from Central Park and The Plaza (whose food hall and Eloise shop are worth a visit). There are tons of family packages with themes like Camp Peninsula as well as scavenger hunts, poolside picnics, and cooking classes. Hotels in this area, especially the Gansevoort, are often thought to be go-to hotels for a younger, louder crowd but this one is actually pretty family friendly which makes it great for all ages. It's located right on the High Line, plus it's near Tribeca which is flush with playgrounds and green space for kids. This hotel in SoHo has a great restaurant, rooftop bar, lots of art, and is in a good location near lots of things to do. Kids can get milk and cookies at bedtime plus access to books and board games. There's a rooftop pool and a great restaurant onsite, The David Burke Kitchen, to make things easy. This is a classic spot for kids. It's a whimsical tea house with fun decor and full-on tea ceremonies which are family friendly. Great for little girls or anyone who loves Alice in Wonderland, fairytales, and so on. There are lots of restaurants near Bryant Park, but an easy meal idea is to pick up a pizza from Little Italy Pizza and walk it over to Bryant Park for an outdoor picnic. This spot in Union Square is one of my favorite places in the city. It's a full-on cereal bar where you can customize your bowl of cereal, set it up at an Instagram station, and sit in swings looking out over the park. A must-go for anyone, but especially great for kids. 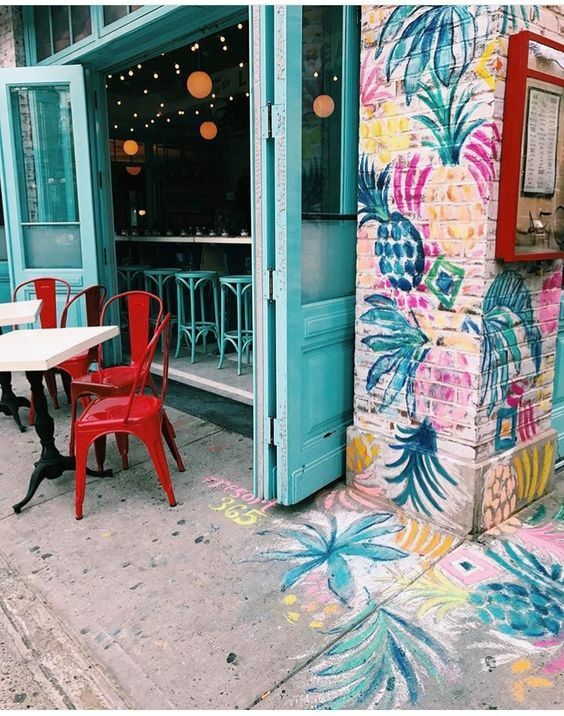 With locations on the Lower East Side and Upper East Side, this is a fun, colorful pizza shop with a beachy theme. Go to Bubby's in Tribeca for a decadent brunch or a scoop of Ample Hills Creamery ice-cream. The atmosphere is relaxed and noisy, perfect for families. Try the stuffed pancakes! This is such a cute spot in Carroll Gardens. It's a classic soda fountain that's been around as an apothecary since the 1920s. Sit at the counter and order a grilled cheese and chocolate egg cream for a fun, retro experience. A great spot for families as there is so much to look at. There's everything from dinosaurs to space ships plus all sorts of educational experiences for every age. If you're there in the summer, check out the secret splash pad on the roof. Head over to DUMBO to ride Jane's Carousel on the waterfront. There are also a few playgrounds there with Tarzan swings, splash pads, slides, and epic sandboxes. This museum in Lower Manhattan has tons of hands-on art related activities. You can learn to animate a video, do a sing-along, learn to paint, sculpt with clay, and look at really visually interesting art. Walking the High Line is great for all ages. There's so much to see and do along the way, like the rail yards, the Diller-von Furstenberg splash pad, and a really cool playground with beams. The first time I walked by the playground, I didn't even realize that's what it was. I literally thought kids were just climbing all over the framework of the High Line! Haha. It's my birthday today! I sometimes do a more personal post on my birthday, but I've been sharing these fun New York itineraries lately and I thought it would make sense to post the birthday trip itinerary on my actual birthday! If you have a birthday trip to the city coming up, here's how I suggest you celebrate! Because there is no hotel more special. Prince William and Kate stayed here on their first trip to New York, the Kennedys had an apartment here, the iconic Bemelman's Bar is in the hotel, and each guest receives a monogrammed pillow case in their room upon arrival. This is the place to go if you want to feel special! 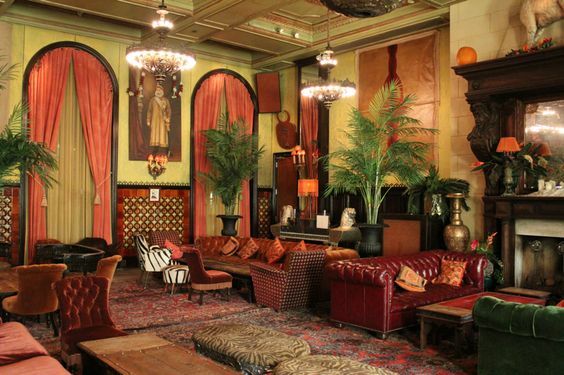 This hotel on the Lower East Side is one I've mentioned before, but it's so cool I have to mention it again. The rooms are beautifully designed and the hotel itself offers a lot to do, which makes it perfect for a birthday trip. I love this hotel for for a birthday trip because it's in a great location on a cobblestone road in SoHo and makes you feel super chic. This hotel near Bryant Park has a great rooftop bar and will also give you a Magnolia cake for your birthday! Have a luxurious tea at Laduree's SoHo location. Share a pot of your favorite blend and try out some of the incredible pastries (the Saint-Honoré is always my favorite) before taking a box of macarons to go. Bubby's brunch is so decadent, it only makes sense to indulge on your birthday. From stuffed pancakes to buttermilk biscuits and, of course, eggs benedict, this is the perfect, classic brunch in the Meatpacking District. Walk it all off on the High Line afterwards. Another great brunch option is Lafayette, a beautiful French bakery in NoHo. The staff is always handsome and the food is delicious. It's classic brunch fare but with a French twist. For dinner, check out Via Carota in the West Village. It's a cozy, rustic Italian place with beautiful details and a gorgeous menu. A lot of celebrities seem to frequent Catch, like Romee Strijd, Taylor Swift, and Kim K. It's seafood, but I recommend coming here just for dessert! Try out the famous Hit Me cake with liquid Klondike, roasted white chocolate ice-cream, and brownie devil's food cake. There are a ton of other amazing options, too. End your birthday with drinks at The Polo Bar where you might run into actors, politicians, or even Ralph Lauren himself. Be sure to make reservations well in advance, preferably a few months out. I have to admit, this has been a challenging post to put together! There are so many places I love in the city and want to share with you, that it's pretty impossible to narrow things down. Not to mention the fact that there are undoubtedly a ton of places I'm omitting because I haven't experienced them or even heard of them! Cool places are always popping up and disappearing. Joe's - For classic, thin and saucy New York pizza. The sauce is sweet and amazing! Artichoke - Highly recommend the namesake artichoke pizza (it's like artichoke dip but pizza) or the margherita. Roberta's - Known for being some of the best pizza in the world, these slices are blackened and a little spicy. Martha's Country Bakery - You can get pretty much any dessert you want here and everything is delicious. Levain - They make the best chocolate chip cookies I've ever had. They're big and gooey and perfect. Almondine - A cute little spot in DUMBO where you can get beautiful pastries as well as a French bakery lunch to take to Brooklyn Bridge Park. Dos Caminos - Great place for margaritas, chips and guac, and queso. It's kind of hard to find queso in the city, so this is the spot! Dos Toros - My favorite tacos in the city. I'd probably eat them once everyday if I could. Sophie's Cuban Cuisine - Try the fried plantains, veggie empanadas, and the white bean avocado salad. Han Dynasty - They make the most delicious lo mein! I'm partial to the location in the basement food hall of City Point in Brooklyn. Momofuku Noodle Bar - The go-to ramen spot. Nanatori - My best friend and I found this little spot in downtown Brooklyn late one night right before closing and it was the most relaxing experience. Plus, the service is wonderful and they give you a palate cleanser with your bill. 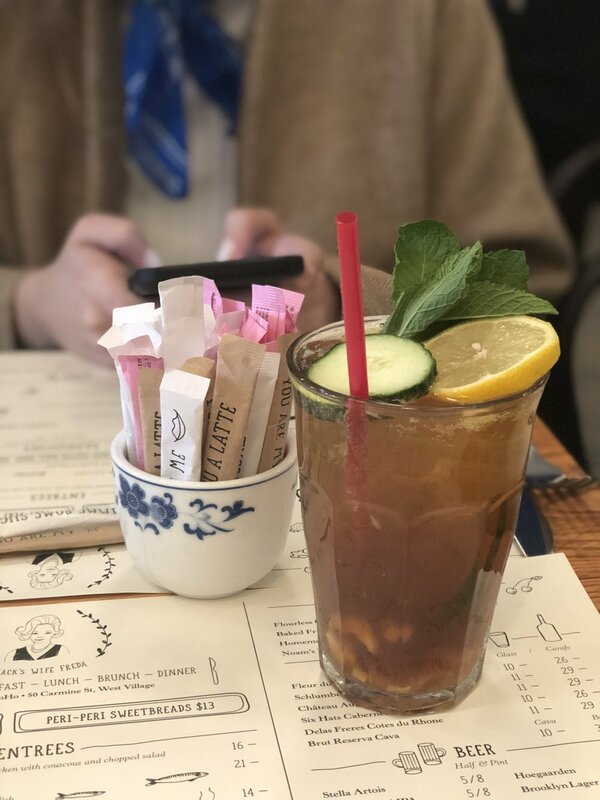 Sweethaus - My favorite little cafe in Williamsburg! They have really good food (try the grilled cheese and tomato soup), yummy desserts, and it is really cute. They have a wall of candy and a 'frosting room'! Toby's Estate - Toby's Estate is my favorite coffee place to meet with friends or to have a chai and kill time. There are several locations in Manhattan and Brooklyn, but the beautiful Williamsburg location is my favorite. Maman - Incredible food and the cutest ambiance. Their SoHo location has an adorable market next door, too! Blossom - I had the best meal of my life here: seitan scallopini with pomme puree and sauteed kale followed by a flight of vegan sorbet. If you are plant-based (and even if you're not), you must eat here. I also love that it has a very classic, laid-back vibe. Candle 79 - For a higher end vegan meal, I highly recommend Candle 79. They serve the most beautiful, organic and plant-based food at their restaurant. I vividly remember loving the fact that they serve the food at room temperature, which makes it so much better. The Butcher's Daughter - This is a great spot for a quick juice or a casual breakfast. Swift's - I love this cozy bar in NoHo. It kind of has an elevated Harry Potter vibe even though it is Jonathan Swift themed. Really great for people who like books and cozy things! The Clocktower - Located inside the gorgeous New York Edition hotel. The bar is housed in what used to be the old MetLife offices, so it is very elegant with a great old world vibe. Dig Inn - I love Dig Inn for a a healthy lunch during the work day. They have a build-your-own market bowl setup with really good warm food options like coconut roasted carrots and Jasper Hill mac + cheese. Le Pain Quotidien - Le Pain is kind of like a fancier Panera, a sort-of upgraded fast casual. The food is really good and there are lots of locations across the city. Taz Cafe - I order my lunch from here quite a bit when I'm working in FiDi simply because they have one of the biggest menus I've ever seen. You can pretty much get whatever you desire from this one place. Veselka - This Ukrainian spot is my favorite in the city and is open 24-hours a day. I can't tell you how many times I've been here at all hours of the day and night eating pierogies, drinking egg creams, and making memories. Bluestone Lane - I adore this healthy, Australian spot that has a couple of different locations. My favorite locations is in the West Village on the corner. I've tried nearly everything on the menu and it's all good, but definitely try the gluten-free banana bread. The Strand - It's not just my favorite bookstore, it's also an iconic New York spot where you can explore eighteen miles of discounted books. There's also a ton of cute, kitschy things like keychains, candles, and notebooks. Housing Works - This used bookstore in SoHo has a rustic, magical vibe like what I imagine Flourish & Blotts would look like. It is entirely run by volunteers and proceeds go to the causes of AIDS and homelessness. Rizzoli - This book publisher has an absolutely beautiful store near Flatiron. Definitely check it out for coffee table books and gorgeous vibes. ABC Carpet & Home - This is the mothership for anyone who loves home decor and design. It's like a huge, well-curated and high-end flea market with everything from gorgeous rugs to door knobs and pillows. Roman & Williams - You all know I love R&W. I always say you can just feel how luxurious their products are by being in their presence. From big furniture to accessories and flatware, this is where you should go to splurge. Anthropologie at Chelsea Market - This is my favorite Anthropologie store in general because it is huge and very well merchandised, but they have an especially good home section here. The Oculus - No matter your style, you'll find several stores in the Oculus that you'll love. My favorites are Cos, &Other Stories, and Reiss. Nolita - Some of the best boutiques and brand exclusive stores are in this area near SoHo, away from the frustrating bustle of Soho itself. You'll find Everlane, Brandy Melville, Kith, and the boutique Warm. Saks 5th Avenue - You could also go to Bergdorf's or Barney's but I'm kind of partial to the magical feeling they create at Saks 5th Avenue, especially around the holidays. Credo Beauty - All natural, ethical, and cruelty free beauty products. I love shopping here because I know that anything I buy will meet a rigorous set of standards. Sephora Union Square - This is my favorite Sephora in the city. It isn't huge, but it's never too crowded and has really good lighting. SpaceNK Apothecary - A cute little store in Williamsburg for a curated selection of luxury beauty like Byredo and Tata Harper. The High Line - No matter how touristy it has become, the High Line will always be one of my favorite outdoor spots in the city. I love getting an ice-cream from Bubby's and walking along the whole High Line. Brooklyn Bridge Park - I love this area in Dumbo, both Brooklyn Bridge Park and Main Street Park. It's right on the water with a beautiful view of the Manhattan skyline. You can check out Jane's Carousel, the West Elm headquarters, and the cute little rocky beach. Jefferson Market Garden - This is actually the garden outside my library and it is the most magical little spot. It's tiny, but filled with beautiful flowers and trickling fountains. Central Park - Specifically around Bow Bridge, Gapstow Bridge, the Ramble, Belvedere Castle, and the model sailboat pond. Williamsburg Cinemas - My go-to theater because it's near my neighborhood and it is super cheap, especially for a new releases theater in the city. You only pay like $11 for a ticket as opposed to $17+ anywhere in Manhattan. Alamo Drafthouse - I love, love, love treating myself to a film at Alamo Drafthouse. They serve a full menu of food and play cute vintage films before the movie. The Angelika - This theater is really nostalgic for me because it's where I would go to see films when I was interning in the city. I saw some of my all-time favorite movies for the first time here. You can sometimes feel the subway beneath your feet in the theater which is really charming. Marie's Crisis - This is the most fun place in the city. You go and drink beers and sing Broadway songs with a live pianist. It is the tiniest, most dive-y place ever but it is so much fun. House of Yes - My favorite 'club' in the city because they host elaborate theme parties with crazy live entertainment. Plus, you never get that creepy, aggressive vibe that I always experience at other clubs. They're very deliberate about creating an inclusive, safe environment. Happy last day of April! I'd say 'where has the month gone?' but really, this month for me didn't speed by as fast as months have been seeming to do since the beginning of the year. It's not that it dragged on, it just felt appropriately timed. When I haven't been barricaded in my apartment to avoid the too cold weather, I've been spending most weekends shooting photos, working on a big project, and spending time with friends. As of now, I'm writing this from the airport. This past weekend was a fun one. My best friend came to visit and to celebrate my birthday early. I thought it'd be the perfect weekend for a 'weekend in my life' post, so here it is! After work, I started the weekend by meeting Caroline at The Oculus. I usually walk through here to the train after work so it seemed like the perfect spot and we're also doing this thing where we're pretending to be international super spies, so we decided to rendezvous at the Venus et Fleurs pop-up. After meeting up, we headed over to The Smith for dinner. I've been obsessed with their mac + cheese for years, but hadn't had it in awhile so I was excited! After dinner, we had our favorite Sweet Milk + Cherry gelato from Eataly and stopped by the clocktower bar at the New York Edition. After that, we came home and watched this hilarious new show on Netflix called Aggretsuko which is the most weirdly relatable thing we had ever seen. Saturday morning, I had some errands to run. After waking up, I packed up my bags and headed out to the West Village to return my library books and drop off a package at the post office. Then, we went walked around the library's garden because it was the perfect spring day outside! The flowers were blooming and it smelled so good. Then, we went over to my favorite restaurant Bluestone Lane for brunch where I had my go-to gluten free banana bread with berries, ricotta, and honey. After breakfast, we made a pit stop at The Strand so that I could sell some of my old books.You don't really get much money from this, but it's a decent method of clearing some space at home. Our next stop was MoMA PS1 over in Long Island City. I have been dying to see the James Turrell exhibit forever---it's even on my 101 in 1001 list. It totally exceeded my expectations! It looks like just a painted blue square on the ceiling, but it is actually an open hole in the roof. This day was the perfect day to go because it was sunny, blue skies, and warm with a breeze that filled the whole room. In fact MoMA PS1 might be my new favorite gallery space. It's housed in an old school building, which is totally up my alley. I used to be obsessed with old schools when I was a kid. Then, we headed back to Brooklyn where I finally tried the Milk Bar cereal milk ice-cream and, you guys, it's the best ice-cream I've ever had. That's saying a lot because I'm a huge ice-cream person and have tried so many different places. But this wasn't super sweet, was a little salty, and was seriously amazing. Later that night, we ordered Roberta's pizza and ate it in bed watching Desperate Housewives. Livin' the dream! First thing Sunday morning, I went over to Williamsburg to do my laundry first and got that out of the way. After that, I picked up an iced vanilla latte and we headed uptown to stop by the Albertine bookstore and walk around the park. It was so beautiful out that day and the park was filled with pink blooms. 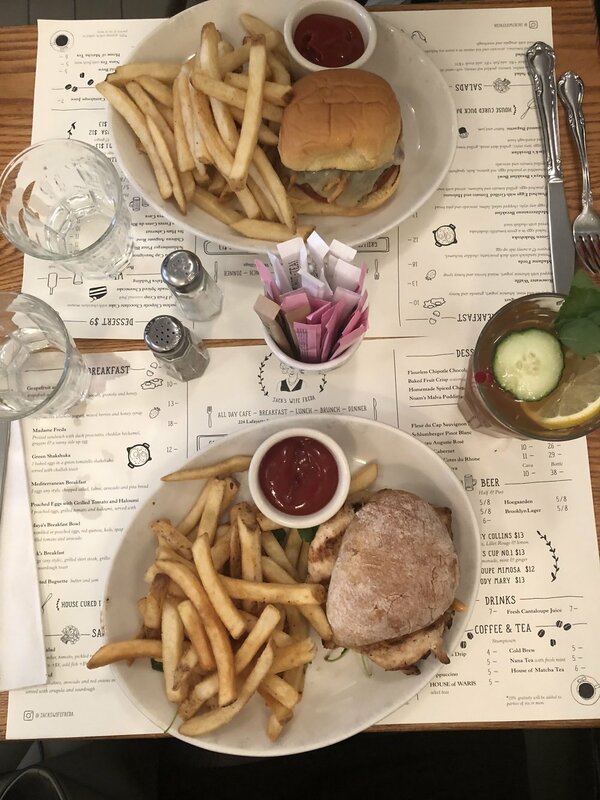 After our walk, we headed down to SoHo for a late lunch at Jack's Wife Freda. 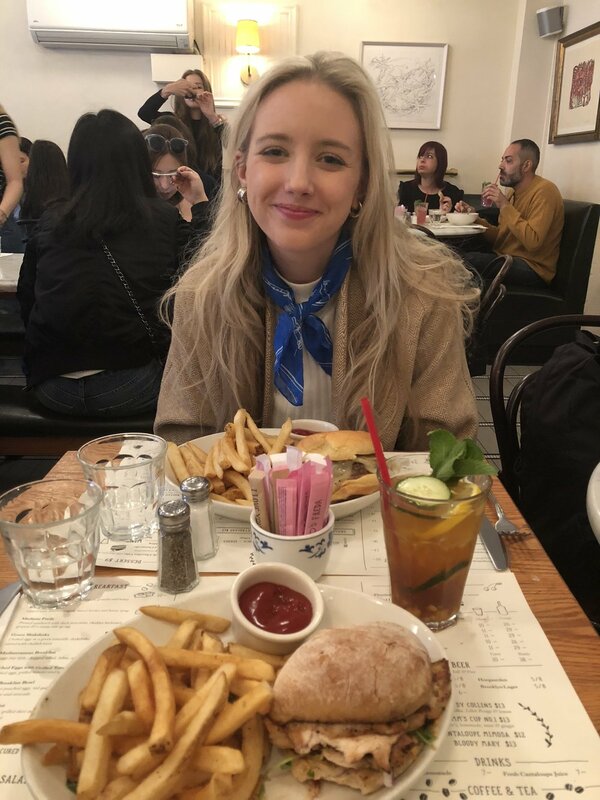 I had a Pimm's cup as a way of celebrating baby Prince Louis and the yummiest fries! Then, we walked around the are to browse at Glossier, Brandy Melville, Madewell, and Kith. Just to keep things real, I'll mention that I witnessed a scary domestic dispute when I was in the train station heading home. It was incredibly wild and really sad, but it reminded me that one thing I love about New York is that if someone is in trouble, everyone around will have your back do their best to protect you. All-in-all, it was a really beautiful weekend and I'm so happy that I took so many photos and can look back on it!